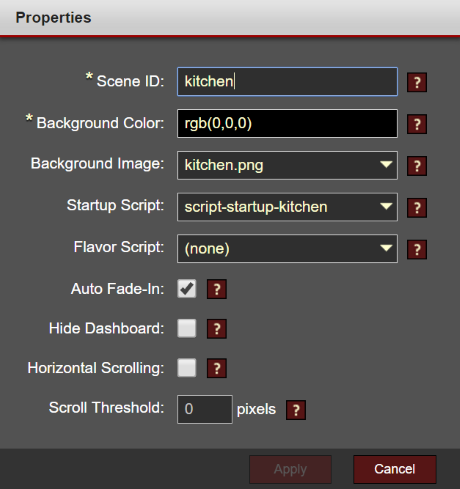 The Scene Properties dialog controls the properties and behavior of an individual scene. Upon launching the Scene Properties editor, you can get additional help by clicking the help icons next to each field. If your scene is wider than 1020 pixels, the viewport can scroll horizontally when the active character is near the left/right edge. Depending on the character's frame size and the width of the scene, you may need to experiment with threshold values to ensure the scrolling is smooth and predictable.